This beautiful pizza is healthy, simple, and easy to make. You can grow most of the ingredients in your garden, all the more reason to get creative when you are planning your garden and making your pizza! You can use veggies of various colors but here’s what we picked. Kids will love to decorate and try this veggie pizza! Preheat oven to 475°F. Next, brush your baking sheet with 1 tbsp. of olive oil or you can line it with parchment paper. Combine the two packages of dough together to form into a ball, then use your hands or a rolling pin to flatten the dough on the prepared sheet until it is 1/4-inch thick or less. Mix the remaining olive oil and garlic in a small bowl, brush the olive oil and garlic on top of the dough. Bake the dough on 475 for about 10 minutes or until dough is firm. Spread tomato sauce on the partially baked crust, and start to decorate. 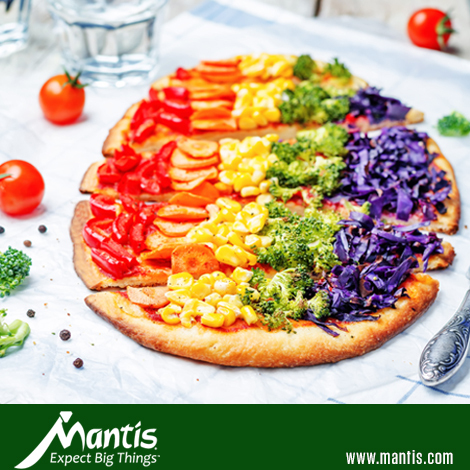 There’s no right way or wrong way to do this, just remember to layer the veggies in a rainbow pattern! We like our veggies crunchy; so we didn’t precook our veggies but you can saute the vegetables for less crunch prior to placing them on the dough. Sprinkle with red pepper flakes, if you like it spicy. Our pizza is vegan, but you are welcome to add cheese to your dough before you add the veggies. Once you have decorated your pizza, stick it back into the oven, and bake for another 10 minutes. Cut and Enjoy!